I’ve got another drawing to share from my watercolor sketchbook here. Remember the last few drawings I did? I’m talking about the ones with Hilda and Richie in fitness wear. They do work out daily. So I decided to try my hand at actually showing such a scene! Ahem, anyway, this was done with watercolor pencils and some diluted ink wash.
Last week, I featured Hilda in fitness wear. Richie works out too. Richie works out together with Hilda doing aerobics, practicing dance, or both (dance aerobics). He’s got his own fitness apparel of course – tights and legwarmers. 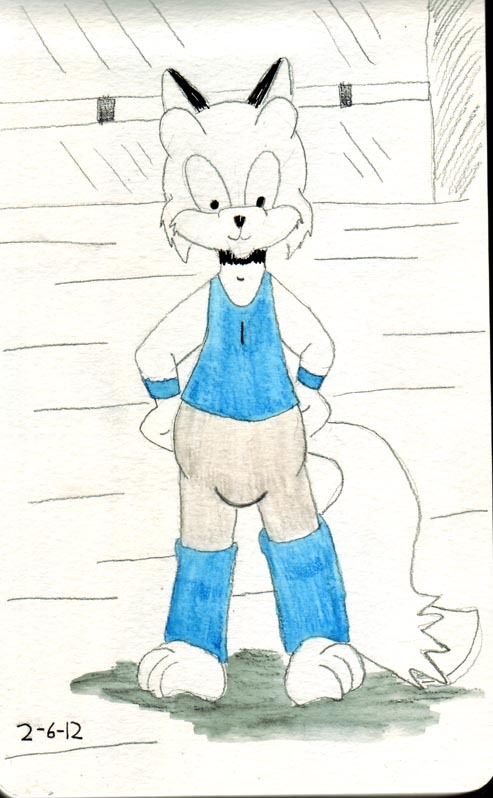 The blue color for Richie’s tank top, wristbands and legwarmers happens to be Derwent brand watercolor, spectrum blue. The grey for his tights is French grey. This is also from my watercolor sketchbook. I thought I’d share a drawing from my Moleskine watercolor sketchbook. Here we have Hilda Otejekker, who you probably remember from the comics pages I showed on here. Hilda and Richie frequently will work out together to stay in shape. They usually do aerobics, dance, or both. 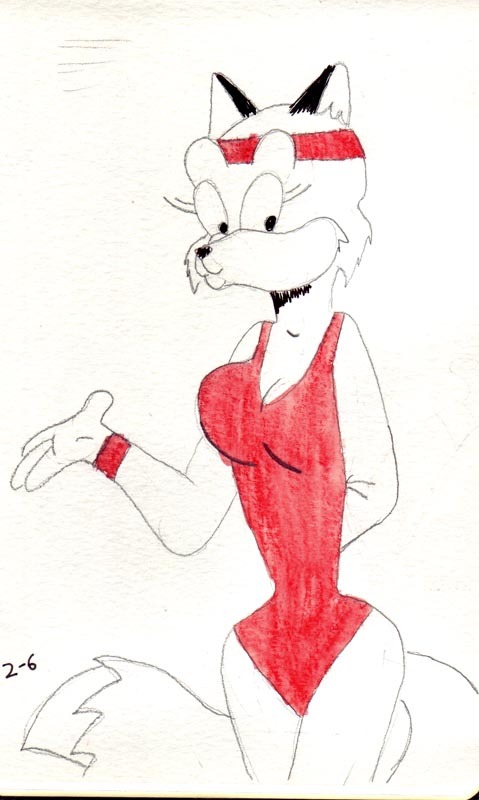 Due to her wealth, Hilda has a whole closet full of dance apparel – most of them being rather low cut and revealing leotards. She’ll also wear headbands, wristbands, and legwarmers with her outfit. This was done with pencil and the red is from a Derwent brand Inktense pencil. It’s really neat – it’s similar to watercolor pencil but is actually ink! The color there is poppy red. This was heightened with a Uniball pen and a graphite stick. Today, I thought I’d share with you a cool video. I have a Moleskine brand watercolor sketchbook and I’ve been filling it up with drawings using pencil, watercolor pencils, and ink. Anyway, see for yourself. The waterbrush you see there is made by Niji and should be stocked in some art supply stores. They are very handy for watercolor sketchbooks!